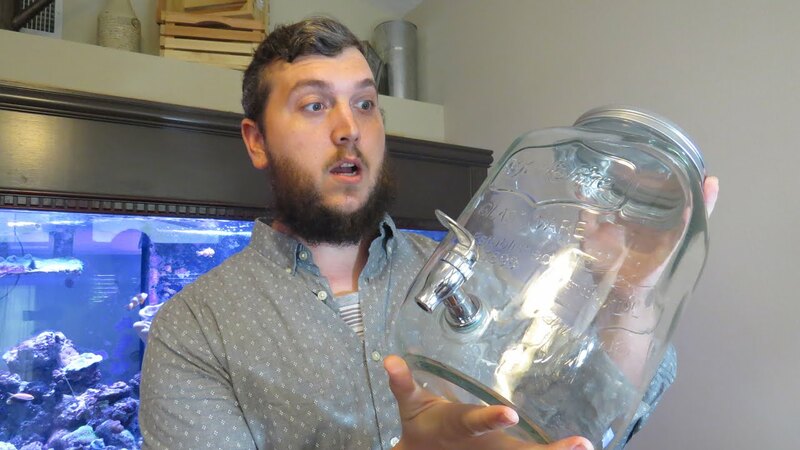 Joey Jones of the YouTube channel TheCoralReefTalk embarked on his own Mason Jar reef tank project in 2016. While we’ve shown off many successful, often long-term aquariums, Jones seems to have taken a different approach than the others we’ve featured. As I wrote in the January/February 2018 issue of CORAL Magazine, experimentation is at the heart of the pico reef phenomenon; if you take well-reasoned chances, be sure to share your successes and failures as you go. And that’s exactly what Joey Jones has done. When searching for my own perfect “vase reef” container, I scoured Walmart, Target, Hobby Lobby, and Pier One before ultimately settling on an attractive apothecary vase from Michael’s. On more than one occasion, I stopped to look at the glass beverage dispensers and wondered if they’d be usable. Was there something metal that could corrode? Would the valve stand up to long-term use, or would it start to leak? In other words, don’t wait for something to get out of hand. Watch Jones explain his mistake, which he shares in the hope that you, the new micro reefkeeper, won’t repeat it! Oh, we feel Jones’ pain as he shares this latest update on his micro reef. In such tight quarters, even something as benign as a hermit crab can really become a problem animal. Destroyer of Worlds? One small creature may have earned that title in Jones’ Mason jar reef. It’s so simple to avoid this problem in hindsight, but we’ll let Jones explain this latest problem himself when you watch the footage below. Jones’ tenacity and transparency are admirable, and we wish you tons of luck getting this reef up to speed. You can catch all of Joey Jones’ Mason Jar Reef Tank videos in his YouTube Playlist.